I am so excited for our friends Jessica Abbott and Celina Bailey! They just launched STYLO- it's the first fashion forward eMagazine centered around children’s sewing patterns and style- and it's incredible!! Click here to subscribe (you will love it.) You can also visit Jessica's blog, Me Sew Crazy, to learn more! We were lucky enough to partner up with STYLO for a fabric challenge in their first issue. They chose Quarter Dot in Mist from our Glitz collection. We chatted with the six designers about their designs so we could share it with you! Here's what they said about Glitz & STYLO! 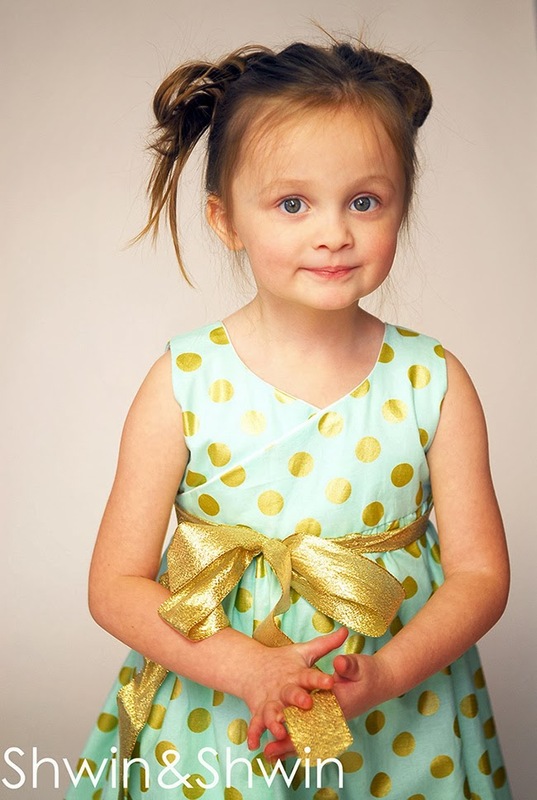 Hi everyone, Shannon here from luvinthemommyhood. When I first spotted the new Michael Miller Metallic Collection "Glitz" I got really excited! I got even more excited when I got my hands on the fabric - Quarter Dot Pearlized in colorway Mist! Both myself and my daughters loved it! I knew right away that I wanted to make something that really just let the fabric shine! It already has so much pizazz and personality that I thought a fun and modern high waisted floor length skirt paired with a comfy knit crop top would be a great combo! We had a great time styling and shooting this outfit which is part of the premier issue of STYLO Children's Sewinge-Magazine. You can also find more of my work and designs on my website veryshannon. Hello! My name is Hayley from Welcome to the Mouse House and I can't tell you how thrilled I am to be over here today. When the lovely ladies from Stylo Children's Sewing eMagazine first contacted me and told me they were sending me Michael Miller fabric, I knew I would love it, but I had no idea what to expect. When my beautiful mint green and gold fabric arrived, I was in LOVE and knew immediately what I would create. 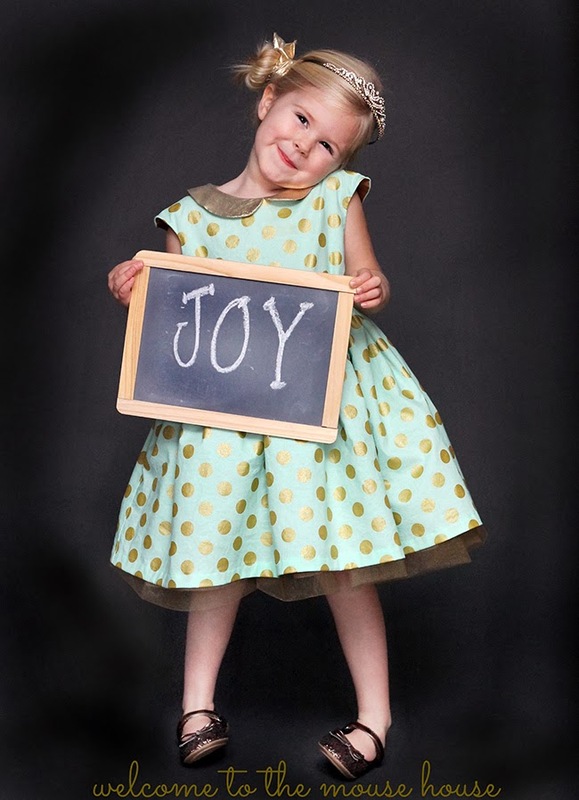 Using my own Caroline Party Dress pattern, I created a timeless and classic dress with a gold peter pan collar, gold satin lining, and a golden tulle kicker skirt. I added a gold belt to it and my daughter was in love. She begs to wear it on a weekly basis and yes, we have even allowed her to wear it to the grocery store! The Michael Miller glitz line is absolutely gorgeous and I hope to get my hands on more of it for future dresses. LOVE!!! When you are being asked to be contributing editor to a new fashion forward e-Magazine all about sewing for kids AND on top of that you are being told you will received some secret fabric from Michael Miller to make whatever kids clothes you want THEN you know you have hit jackpot. I have never opened an envelope as quickly as when I saw the name Michael Miller outside and wow, did the contents not disappoint. I am absolutely in love with this fabric. Gold and mint...yes please!! I LOVE mixing fabrics so I have paired it with this golden/dark mustard colored viscose. I got the inspiration for the dress watching Fashion Police on E! (Love that show btw). They were talking about trends for 2014, lowered waists dresses for women was one of them, and showed this red and white amazing dress. Bingo, I immediately knew that the shape would be perfect for this project. I did not totally copy the dress. My neckline is different and I added a front button placket with big brass gold snaps. The starting point for the pattern is from a Japanese pattern book but I added the flounce, button placket, color blocking and fold up on the sleeves. In other words there is not much left of the original pattern. Feel free to visit my blog SewingLikeMad for more info on this dress. Hi, Shauna here from Shwin & Shwin. I was beyond thrilled to work with Stylo (children's sewing Emagazine) and to get the chance to work with such lovely fabric was great. As soon as I saw the fabric I knew it had a destiny. The gold circles just screamed bubble skirt, so I knew it was perfect for a new pattern I had been working on. I used the Martha Bubble Dress Pattern. I love the fullness of the bubble skirt with the cross over wrap top. I added a gold ribbon that wrapped around the bodice and worked with the lovely gold in the fabric perfectly. It's girly and perfect. Hi there, I’m Stef from Girl. Inspired. The second I laid eyes on this polka dot fabric from the new Glitz collection, I was in. love. 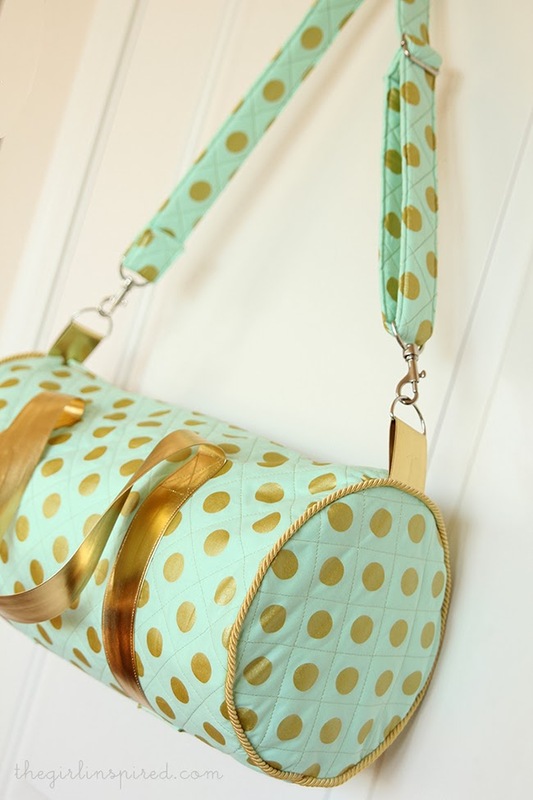 As if the minty “Mist” color wasn’t perfect enough, they’d gone and added metallic gold polka dots??! I knew immediately that I wanted to make a dance bag for my daughter, something functional yet also a bit luxurious. I began drafting a duffle bag pattern and decided to accentuate the fabulous gold. I quilted a diamond pattern using metallic gold thread, added gold piping, and I even snagged the most perfect gold strapping!! The bag is fully lined and has straps for carrying it by hand or over the shoulder. When the bag was complete, I decided it was probably my favorite thing I’ve ever sewn. If my daughter hadn’t known I was making her a dance bag, I might’ve kept it for myself… This project was created as part of the 'STYLO Children's Sewing eMagazine'. The Quilted Luxe Duffel pattern will be available soon at thegirlinspired.com. Hi, I’m Lindsay from The Cottage Mama. 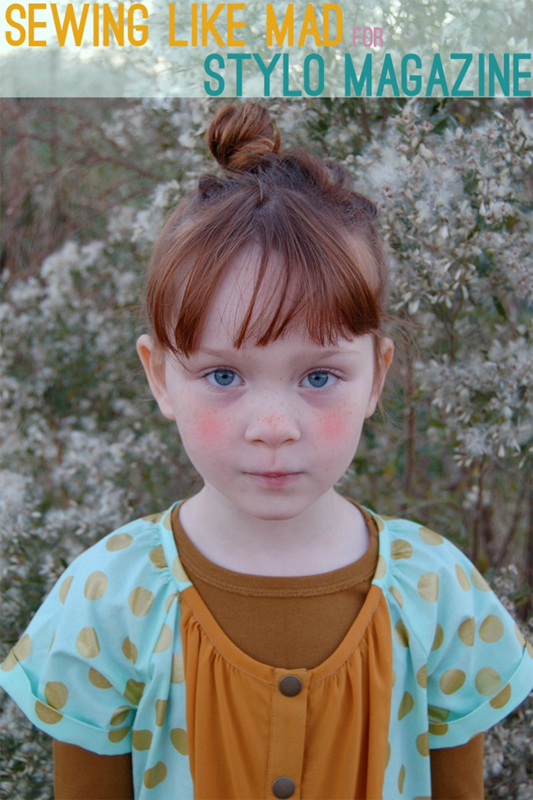 'The Little Lady Classic Coat was created merging two patterns from my new book, 'Sew ClassicClothes for Girls: 20 Girls' Dresses, Outfits and Accessories from The CottageMama'. 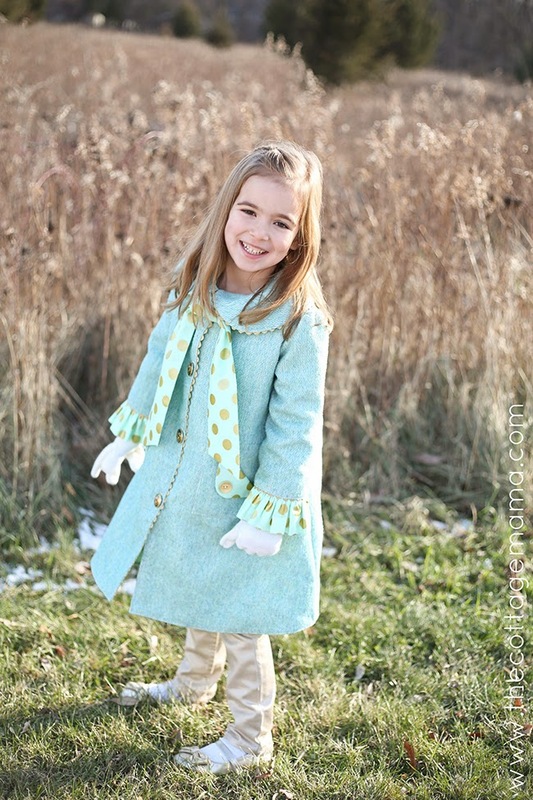 The coat uses the longer length of the Classic Coat Pattern, but incorporates the ruffle sleeve and neck tie from the Little Lady Coat. I wanted to use the metallic dot fabric in a subtle way, thus using it for the neck tie and ruffle sleeve, but also for the entire coat lining. The coat is as pretty on the inside as it is on the out. The exterior of the coat is made from a wool blend fabric which is perfect for added warmth. I incorporated additional gold through the use of metallic rick rack in the collar, down the front of the coat and on the sleeve between the main sleeve and sleeve ruffle. I found several gold buttons to tie the look together. Through the use of the metallic dots this coat is classic, yet modern all rolled into one. Check out my blog for more information! Congratulations to everyone involved in the launch of STYLO! Thanks so much for featuring us over here! The glitz fabric line is gorgeous and I can't wait to try out the confetti version! It was such a pleasure working with this fabric. It is stunning and great quality! Thank you so much for featuring us. The challenge was so much fun. Wow! thanks so much for the lovely feature on the blog! I really enjoyed working with Glitz! My daughter and I both enjoyed it!